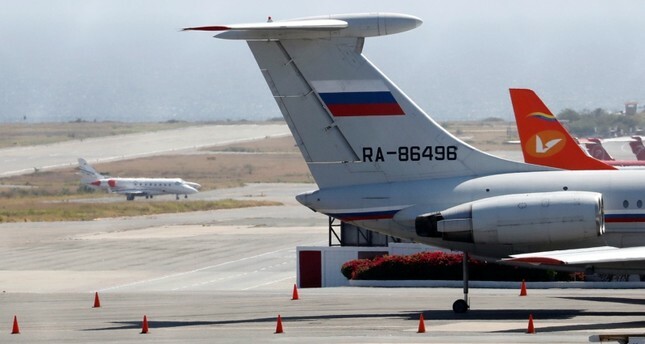 Russian aircraft arrived in Caracas this weekend as part of ongoing military cooperation between the two allies, a Venezuelan official said Sunday. The reports could not be independently confirmed. Associated Press journalists on Sunday went to Venezuela's main airport, just outside Caracas, but did not see Russian planes. In January, Venezuelan opposition leader Juan Guaido declared himself interim president, saying Maduro's re-election last year was rigged. Maduro alleges that Guaido is a collaborator in a U.S.-directed plot to overthrow him. Russia says it is concerned that the U.S. is considering military intervention in Venezuela. The U.S. says it is focusing on economic and diplomatic efforts to oust Maduro, though President Donald Trump has said "all options are on the table."